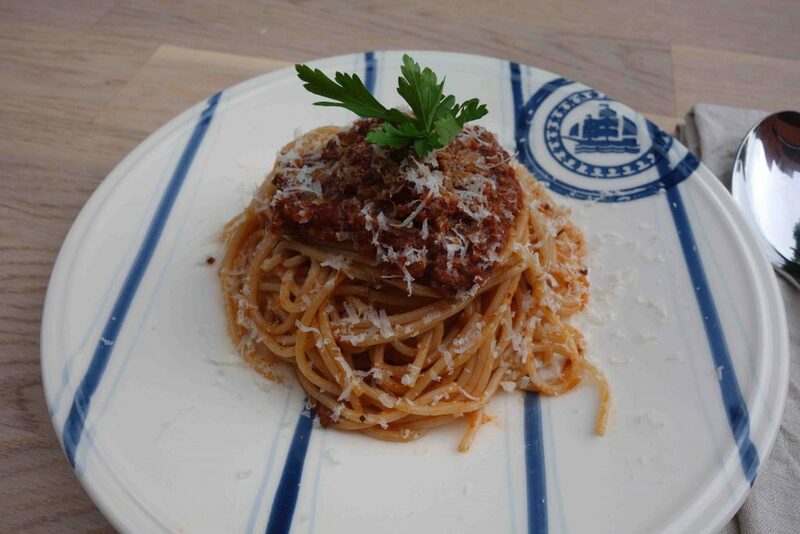 Today I have an absolute classic for you- spaghetti Bolognese. It’s not really Italian, but we love this dish. I associate it with a lot of happy moments, because my mum used to cook this a lot, when I was a child. My version is more on the grown up side and it’s pimped- because I just couldn’t resist. The main and most important ingredient for a good sauce is time. So, try to make it ahead and let it simmer for as long as you can. Of course, high quality ingredients will help as well 😉 Oh, and this sauce is ideal for making a big batch and freezing some for later. First pour some olive oil in a wide pan and fry the minced beef in it. Season the beef with salt, pepper, hot paprika, cayenne pepper and a pinch of cinnamon. Keep frying until it is all browned and crumbly. Next you put it aside and peel and dice the onion and garlic. Now take a big pot, pour in some olive oil and fry the diced onion and garlic. If you want to sneak in some more veggies, you can add some finely diced carrots as well. Fry everything until the onion becomes translucent and add a tablespoon of the Italian herb mix. When it starts to become fragrant, deglaze it with the red wine. Let it reduce to an absolute minimum and add in the passata. Now you add the minced beef as well as some salt and a pinch of sugar and let it all simmer on low heat until a thick sauce forms. Then you can season it to taste.